From left to right: Gene/Jean, Ficus, Quark, Andy, Betty and Betty. 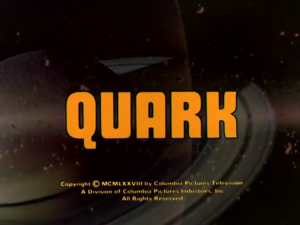 The show follows Adam Quark (Richard Benjamin), whose name was no doubt chosen as much for sounding like “Kirk” as it was for the scientific connotations. Commander Quark isn’t quite the intrepid space hero he’d like to be, instead saddled with the unenviable task of being an intergalactic garbage collector. His misfit crew includes Ficus (Richard Kelton), a plant-based “Vegeton” who is so emotionless and verbose that he makes Spock look like a kid with a sugar rush by comparison; the Betties (Cyb and Patricia Barnstable, the “Doublemint Twins”), a pair of beautiful blondes who are totally in love with their Commander, the only problem being that one’s a clone and no one is sure which; the “transmute” Gene/Jean (Tim Thomerson), whose genderfluid nature emerges as a split personality–an overly aggressive, macho male side and a demure, polite female side, each of which always manages to manifest at the wrong time; and Andy, a robot built by Quark that’s even more cowardly than C-3PO and more willing to sell out his crew than Rygel from Farscape. The pilot episode features a McCoy-like character called Dr. Mudd, who was replaced by Ficus for the main series. Quark also gets his orders from Otto Palindrome (Conrad Janis), who serves as the assistant to “The Head,” a literal disembodied head with an enormous brain. Not exactly the people you’d want to take with you when you’re going against the Dreaded Gorgons (a mix of the Empire and Klingons). Despite the reputation that many 70’s TV comedies have for being dated, Quark actually holds up pretty well. Heck, in some ways it might actually be funnier today than it was at the time, given how much of it we’ve seen done over by now and the ability to binge it making running jokes easier to pick up on. For example, Quark is always called in to receive orders alongside two other Commanders. In the second episode, Commanders Walker and Estro appear as a white male human and a black female human… but in the last episode, Walker is a robot and Estro is a strange-looking alien. There’s no way someone just watching week-to-week back then could have caught that. Speaking of dated, the effects are obviously bad–but they’re also deliberately bad. They use many of the same techniques as Trek, but try to make it clear what it really is for extra comedic value. When you’re doing parody, and especially spoofing one particular property, it’s easy to accidentally fall back on stereotypes and surface level details, but Quark really manages to avoid that. 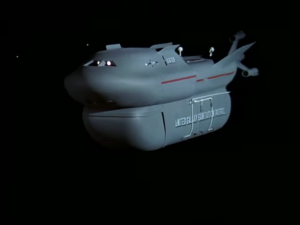 The aforementioned “Goodbye Polumbus,” is a great example of this: while the episode’s basic plot is essentially the same as “Shore Leave,” featuring a planet where a person’s dreams and desires are made real, the show doesn’t just flat out copy the Trek version. Quark actually manages to figure out what’s going on by himself, and makes the decision to destroy the technology behind this place for the good of the galaxy, even when it’s clearly offering him a much better life. It’s an interesting watch independent of its relationship to what it’s spoofing, and that’s pretty rare. Which actually brings up a related point: too often, comedy protagonists are just absolutely horrible people, and the shows function off of watching them suffer for their vices (think of someone like Zapp Brannigan). Quark doesn’t do that at all. While he’s got a menial job, Quark does his best at it, and even when saddled with the extremely dangerous, suicidal missions he’s often sent on, he faces them all with heroic resolve. He never really takes advantage of anyone, and he’s hardly judgemental. It sounds weird to say, but Quark would actually fit in pretty well in the real Starfleet. Quark’s ship, the… uh… the… I don’t think it has a name. It’s from the 70’s, the heyday of the bad laughtrack. While it’s somewhat annoying, it could be a lot worse, so I’m generally willing to forgive it. Gene/Jean’s transmute routine could definitely grate on some people’s nerves. It’s received accusations of being homophobic, although I’m not sure that’s quite what’s going on… but then I wasn’t around in the 70’s, either. Others might complain that the feminine “Jean” personality is stereotypical and demeaning, but then the male persona is equally stereotyped–that’s the whole joke, after all. I guess the third option would be to point at this as an example of genderfluid characters in fiction well before the time when that concept really solidified, but that’s going to irritate a totally different section of the population. You really can’t win here. Fortunately, Gene/Jean has the least screentime, so it’s not a huge issue. The more familiar you are with Star Trek, the funnier you’ll likely find it. The inverse also applies, though: if you can’t stomach TOS then I doubt you’ll appreciate Quark, either. In the end, I’d say Quark was definitely on the “too niche for network TV” side of the equation. Had it been possible for it to debut on cable where smaller audiences could keep it afloat, it’d probably have been a decent success. In an added twist of irony, the show aired on NBC, much as Star Trek had years before, and was unceremoniously canceled in much the same way. No letter writing campaigns this time. While the show has only 8 episodes, they’re in a half-hour format (except for the double-length episode 2), so it’s a quick and easy watch, and definitely one that’s worth the time investment for Trek fans. 3.5 UFOs. Definitely a cult classic, but a quality one. A quick reminder of my rating system: a 5 represents must-see–a “hidden gem,” as it were. A 4 is good, solid television. A 3 is “cult classic” stage, where the show’s appeal is likely limited to a specific group. A 2 is flawed, but fun, or even “so bad it’s good,” depending on the series and its release timeframe. A 1, of course, is avoid at all costs. 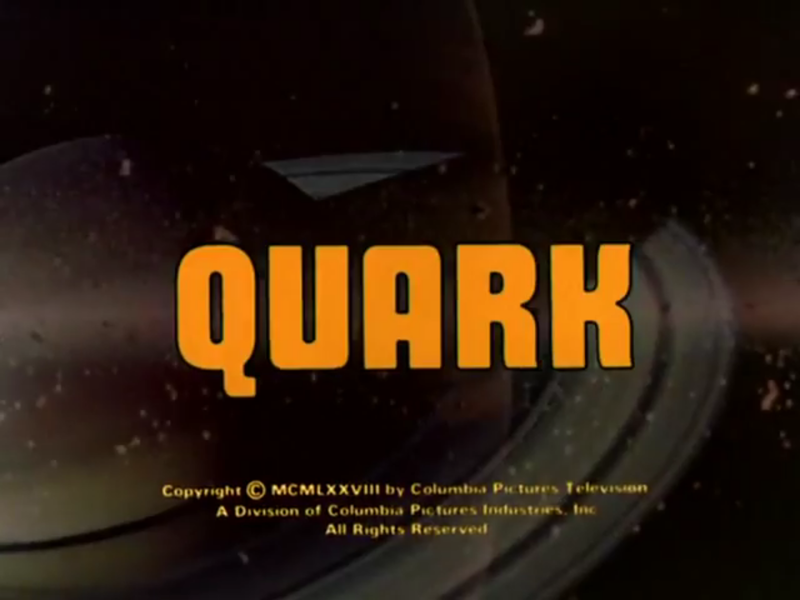 Quark is not available on the major streaming services (Amazon, Hulu, or Netflix) and the DVD had a small release, meaning it’s… prohibitively expensive. Just look below. So in that event, the best I can offer you is this youtube channel, where it’s viewable in decent quality. Check out one of the recommended episodes above and see what you think. ive never heard of this show and it sounds like i would love it. is there any connection between naming quark on ds9 and this?